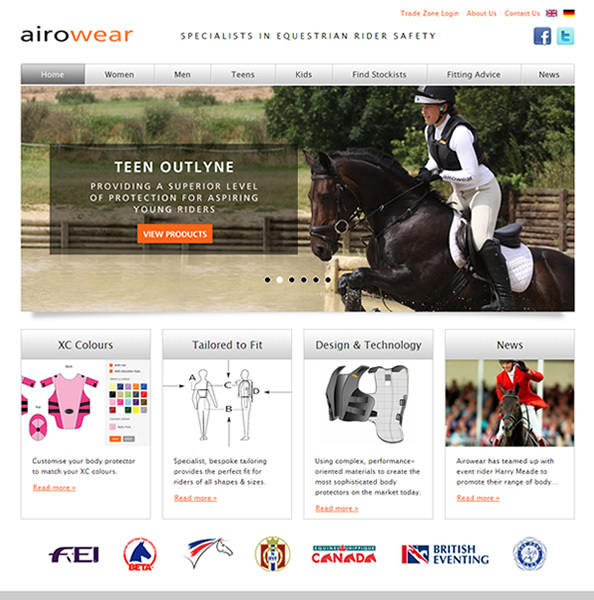 Around Christmas time, we launched a brand new website for Airowear, a leading designer and supplier of equestrian body protectors. 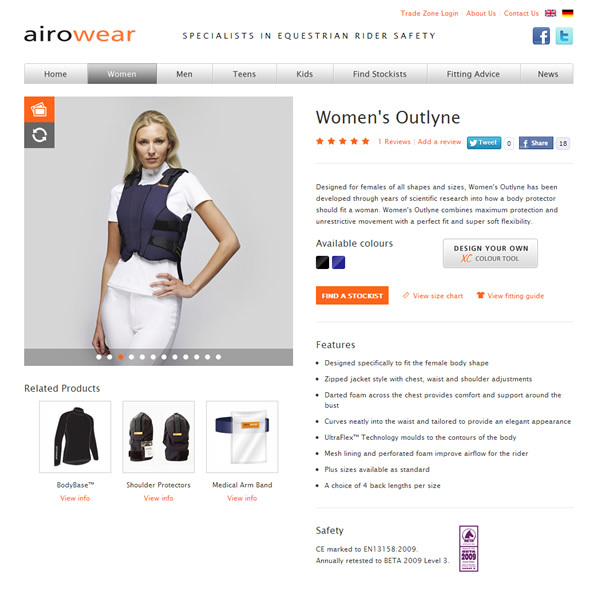 With a reputation for design expertise incorporating the latest technology, Airowear were also keen to use the new website to promote their unique offering of body protectors in both men’s and women’s sizes, designed to fit their body shape. As well as these core messages, the website also needed to bring a fresh new look to their entire product range, to give stockists access to key sales materials and to develop a German language version of the website given this is a key market for the business. All of the product pages feature an extensive gallery of photos, all with the ability to zoom and rotate using jQuery. Full product information, features, colour options, size guides and fitting information is readily available, whilst users can also read reviews from other users and submit their own. Airowear have hundreds of stockists across their core markets of the UK, Ireland and Germany, and many more across the globe. The stockist directory allows customers to find their nearest stockist via a country and/or postcode search, and contact them direct or visit their website. 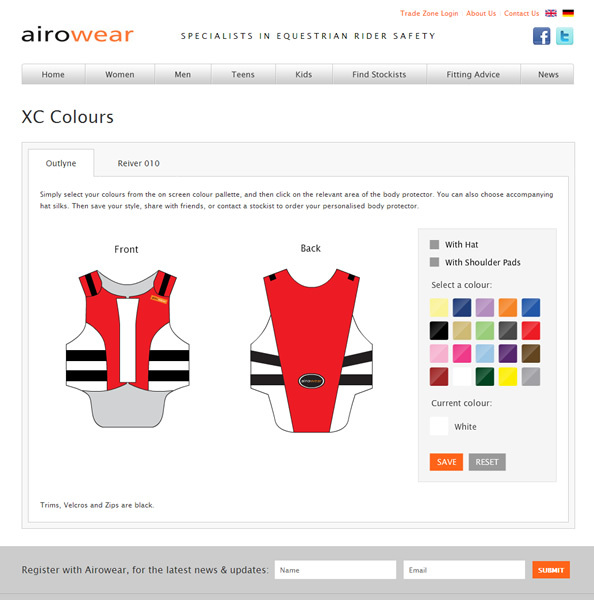 The website features an interactive design tool to allow customers to design their own customised body protector. Users can then share the design via social media, download or order via an authorised Airowear stockist using the unique design reference. 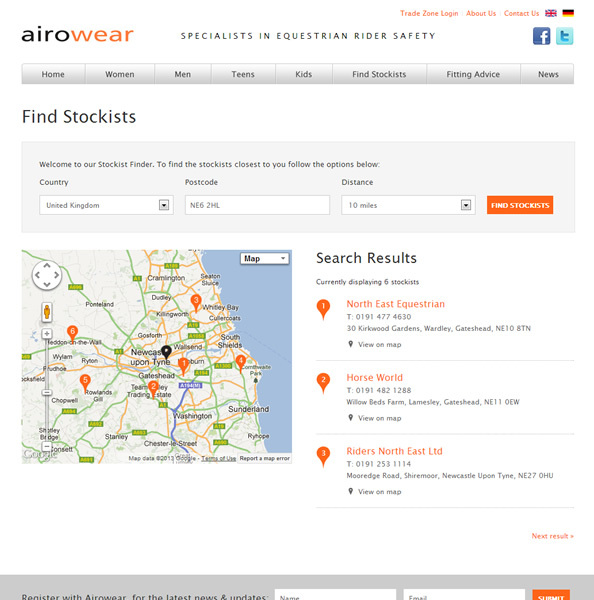 Tradezone has been developed specifically with Airowear’s national and international stockists in mind. The latest product photography, advertising, sales literature and documents are all easily available via this section of the website, allowing Airowear to bring consistency and efficiency to the distribution of their sales materials. In turn, the stockists can better market and promote the entire Airowear product range, increasing sales opportunities. The Tradezone also features an amended version of the design tool which allows stockists to submit online orders for customised body protectors on behalf of customers via their unique log-in. The completed website has delivered on all of the project objectives and also brought real efficiencies to the client’s process via the Tradezone section of the website. The site has drawn positive feedback from customers and stockists alike, and we hope to continue to work closely with Airowear on further digital marketing during the course of 2013 and beyond.